My parents moved out of my childhood home a few years back. I posted about it here on the blog in January of 2016. Right before they left, they had an Estate Sale that featured a bunch of their stuff, but mostly my Dad's collections. Oil cans, automobilia, pottery, toasters, radios and plenty of junk. There were also a few boxes that he had brought home from his office at Governor's State decades before that I didn't ever see or come across in digging through his stuff like up in Michigan and what-have-you. In those boxes were a bunch of Chicago Bears memorabilia - pennants, glasses and this photo featuring my favorite player Dan Hampton and (in the background) Coach Mike Ditka (in a great pear of coaches shorts). The writing on the matte say it is from August of 1986 in Platteville Wisconsin. 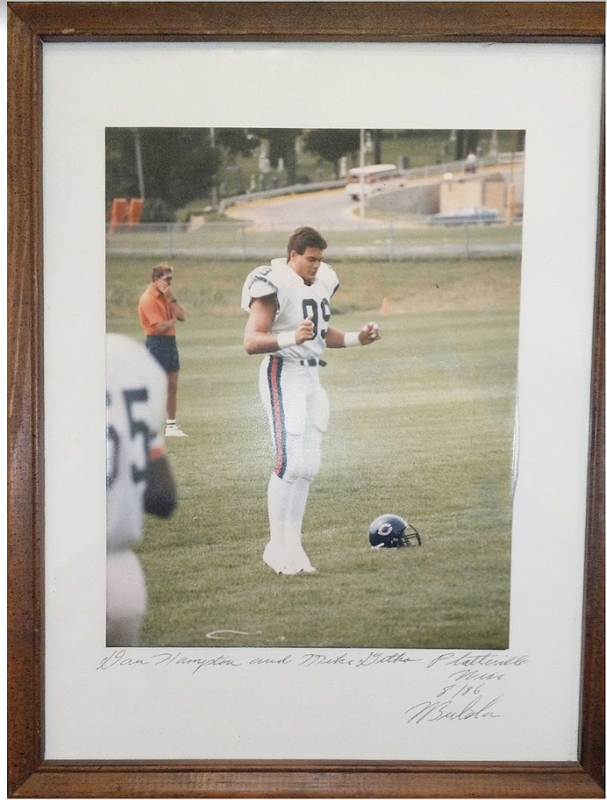 I've posted another Dan Hampton photo here on the blog from my childhood. He was my favorite and I'm thinking he was my Dad's, too. Back to the estate sale. This was slated to be sold, but I grabbed it and stuck it in our storage unit amongst a few other things. Now? It's hanging in my Boy's room. Nat plucked it out of the pile of framed things and decided to put it up. Kinda awesome.